NASA spacecraft New Horizons just met up with a rock some three billion miles (5 billion km) out in space — Pluto, formerly known as the ninth planet in our solar system. A meeting nine years in the making, the flyby is producing amazing images and revising our knowledge of the origins of our solar system. Artist's rendering of the New Horizons spacecraft. Courtesy NASA/Johns Hopkins University Applied Physics Laboratory/Southwest Research Institute. Click for larger view. On board the spacecraft are seven instruments: a visible and infrared light spectrometer, an ultraviolet spectrometer, a passive radiometer, a telescopic camera, a plasma spectrometer, an energetic particle spectrometer, and a student dust counter. After getting an early boost from Jupiter, New Discovery just rendezvoused with a rock some three billion miles (~5 billion km) out in space - Pluto, formerly known as the ninth planet in our solar system. The US has now reached every planet with a space probe, and this latest meeting marks the completion of the initial reconnaissance of the solar system. 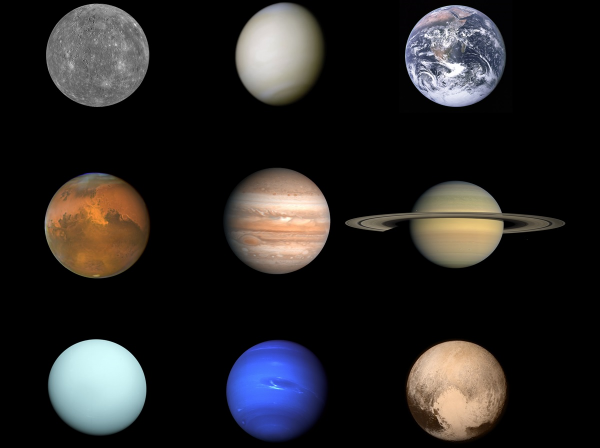 Our solar system family portrait is now complete. Courtesy Ben Gross.Click for larger image. Just before 8am US EDT, (12pm UTC) New Horizons flew about 8,000 miles (~13000 km) above the demoted planet's surface, and streamed moonlit-images back to an eager audience. The images show an unprecedented glimpse into the origins of our own solar system. Pieced together from multiple viewpoints, they will help scientists construct a topographic map of Pluto's surface. Up next for New Horizon is an exploration of the Kuiper belt, a mission ranked as the highest space exploration priority by the US National Academy of Sciences. Check back throughout the week as we update this story with the latest views from New Horizon's Pluto flyby. And be sure to check out our #PicturePluto contest on Twitter to enjoy some madcap renderings of what could possibly be hanging out up there. Update 16 July: A close-up of Pluto's largest moon, Charon. In this view, a "mountain in a moat" can be seen in a depression on the moon's right side. Charon's smooth surface leads scientists to speculate there has been recent cryo-volcanic activity. Courtesy NASA/Johns Hopkins University Applied Physics Laboratory/Southwest Research Institute. Click for larger view. Update 15 July: Close-up images reveal a youngish mountain range, with an ice foundation. Contrary to expectations, Pluto is also not pock-marked with craters. Courtesy NASA/Johns Hopkins University Applied Physics Laboratory/Southwest Research Institute. Click for larger view.